Leo-individualities are commonly full of energy and like the action. They are ready for anything and can slightly act spontaneously. The year 2017 will be a bit slower than they you may wish. Nevertheless, it is also beneficial because you will be able to cope with many things. You will control the situation. You should use this time to your advantage and act wisely. Accomplish the long-planned projects and then pay attention to smaller ones. Thus, you may enjoy an incredible success in your career. Afterward, you may improve your love affairs and relations with your friends. Leo-personalities possess different qualities. Most of them are beneficial. They may help even other people. Nonetheless, some of their traits may induce harm to Leo and those around them. It is necessary to think all the actions thoroughly through. It is always easy to spot Leo-individualities in the crowd. They merely shine with their great inner energy. They are very confident in what they say and do. They are determined and always reach what they need. These folks are naturally born leaders and commonly, they stay in authority. They know how to optimize the work of any worker and their groups are more successful than those whose leader is a person born under another sign. They are optimists and realists. You can fully rely on them if you are their close person. All the happenings of this year will be a bit slower than you may like. This concerns the personal relationships as well. However, you should not be desperate and angry about this fact. This will become your advantage. Your love affairs will be very serious and a slower rate will help to dealt with them properly. You will not make any hasty decisions. You will know for sure what to undertake and how to use it for your own interests. In the case, you are in the relations with Leo and you think that the relations are far from settled, you may change your mind in the next year. Quite soon, you may find yourself engaged with Leo. In the case, you are already engaged you will marry him or her. If you are already married, the next step will be to conceive a child or more. All the private relations will be very serious and strong with any Leo this year. 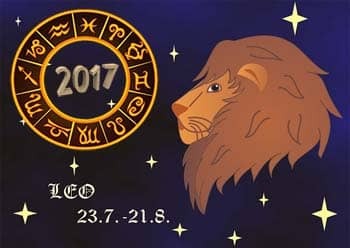 During the entire 2017, Leo-individualities will be focused on their romances. However, the tendency may change in the favor of their friends when the end of the year will be nearing. All Lions are known for being devoted to their family and the closest friends. This is a very favorable year for reaching the greatest heights at work. You will enjoy a tremendous progress due to your incredible resourcefulness and innovative ideas. You have many bright and smart ideas do not miss your chance and realize them. Do not be afraid. Your good fortune is right beside you. You will act confidentially and others will seek your professional advice. Avoid any confrontation with your boss. If being in good relations with him or her, you may possibly enjoy a great promotion or your salary will be increased. Summing this all up, you simply have to remain yourself and show your best qualities and all string sides. Then, you may achieve whatever you may wish. This is a very prosperous year in many aspects. One of such is a financial matter. However, all Leos should act wisely and think before acting. In addition, they may be lucky with a lottery win or some old investment they wished to make. Mind that your energy stores will live through upheavals and falls during the entire year. At times, you will be strong and resourceful. However, sometimes you will be lacking energy. Get prepared for such periods. Therefore, you should train your mind and body. When the time of complications comes, you will be ready to act longer. Do not be lazy or you will miss many nice opportunities. Use some foods to improve your metabolic processes.